Mauviel, a French family business established in 1830 and located in the Normandy town of Villedieu-les-Poeles, is the foremost manufacturer of professional copper cookware in the world today. Highly regarded in the professional world, with over 170 years of experience, Mauviel offers several different lines of copper cookware to professional chefs and home cooks that appreciate the benefits of their high quality products. 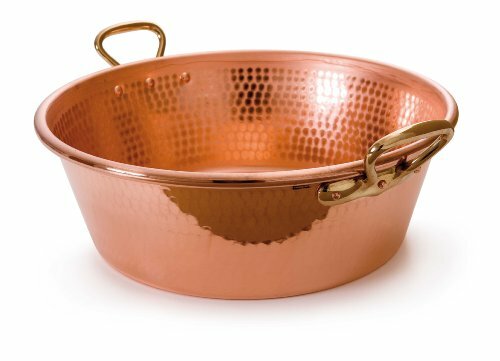 Professional cooks can attest that copper cookware is an essential part of every cookware collection as it is 2X more conductive than aluminum and 10X more conductive than stainless steel. This advantage makes copper the very best material for cooking, as it is unsurpassed in its ability to heat up evenly and rapidly and to cool down quickly, allowing for maximum control and great cooking results. If you have any questions about this product by Mauviel, contact us by completing and submitting the form below. If you are looking for a specif part number, please include it with your message.